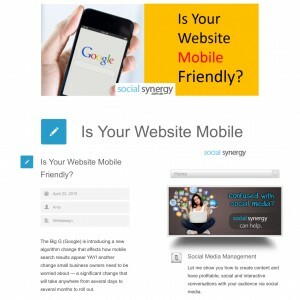 Social Synergy / Webdesign / Is Your Website Mobile Friendly? The Big G (Google) is introducing a new algorithm change that affects how mobile search results appear YAY! another change small business owners need to be worried about — a significant change that will take anywhere from several days to several months to roll out. So what does this all mean? When you do a Google search on a mobile device, Google will prioritise the search results with websites that they deem ‘mobile-friendly’ — ones that do not have software like Flash and feature larger text for easy reading, easy-to-click links and a responsive design. Sites that aren’t up to scratch will supposedly appear lower in search results. For small biz owners like yourself it’s a a great kick in the pants to make things happen and get up to speed with your online presence. Otherwise, not be found at all in the search results. Did you know that 75% of your visitors to your site, are using a mobile device. Imagine not being visible to them? Its important to understand if you are serious about your business for the future you need to be aligned with someone who has their ear to the ground. Who knows their shiz. Not just anyone will be able to make this happen for you. If you know your website is not Google ‘mobile friendly’ or you wan’t me to check it for you Click Here pop your details down and we can have a chat to see if I can help you. After all your website should be a huge generator of enquiries for you. If its not, then why not make it be a huge source of traffic? and make it a mobile friendly website whilst your at it. Don’t become a statistic. Make contact now with me and I will give you a complimentary website health check.